They are brightly colored, gregarious, and flamboyant. They are fast and fierce as a missile when it comes to securing a meal. And they can be deeply committed to others. These are just some of the characteristics of the 22 bee-eater species making up the Meropidae family. Aptly named, these birds fearlessly pluck bees (and other flying insects) out of the air with their strong, downward curved beak, smack the victim’s head on a branch to stun it, rub its rump on a surface to remove the stinger and flush out the toxins, and chow down. Most bee-eater species are found in Africa and Asia, with some in southern Europe, Australia, and New Guinea. They are medium-sized, boisterous birds; males and females look nearly alike. 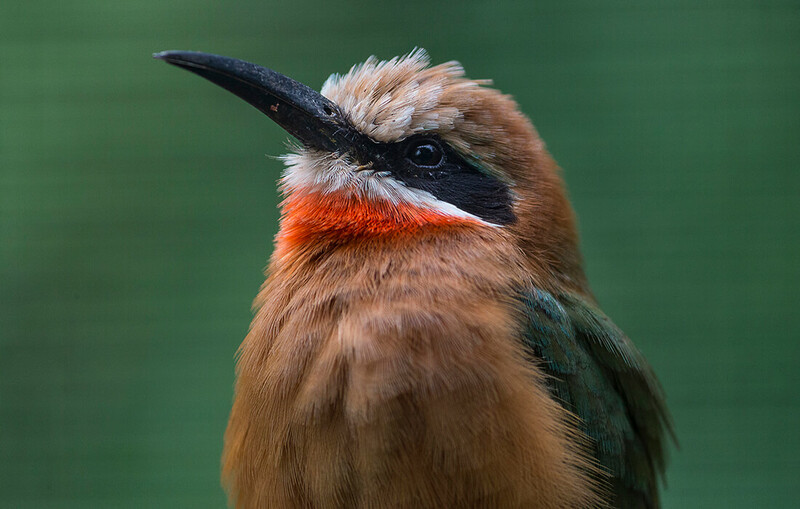 The San Diego Zoo is pleased to share two bee-eater species in a walk-through aviary in Africa Rocks: white-fronted Merops bullockoides and white-throated M. albicollis bee-eaters. Birds of a feather. Bee-eaters have one of the most complex social systems of any bird species. Many species (but not all) are monogamous, cooperative breeders living in large colonies of over 100 birds, but can reach 200 birds if conditions are favorable. Bee-eaters of both sexes alternate between being breeders and helpers in their clan. Each bird lives in an extended family with members of four overlapping generations. They appear to recognize parents, siblings, offspring, friends, and nesting neighbors, likely from voice recognition. This cooperative behavior vastly improves survivorship of chicks. Females leave their natal group to join her mate’s family. Tall order. Bee-eaters belong to the Coraciiformes Order, sharing the group with kingfishers, motmots, todies, rollers, and hornbills. Commonalities include small feet with a fusing of the three forward toes, brilliantly colored plumage, and cavity nesting in earth-banks or old trees. They are considered a medium sized bird, reaching 9.5 inches in length. Many bee-eater names reflect their flashy feathers if not the lack of imagination of the namers: red-throated, blue-headed, black-headed, red-bearded, purple-bearded, blue-cheeked, and cinnamon-chested, white-fronted, rosy, and little green bee-eaters. Some names harken back to their home: Australian, European, and Somali bee-eaters. Most tropical bee-eater species are largely non-migratory, but some make lengthy, dramatic journeys. The carmine bee-eater performs an elaborate, three-stage migration, which is not yet fully understood. White-fronted bee-eaters enjoy a well-rounded diet of insects deftly plucked from sky and earth. Just bee. The white-fronted bee-eater is widely distributed in sub-Saharan Africa. It has olive colored upper parts, a white forehead and chin, and a red throat. Its tail is square. The white-throated bee-eater is a striking looking bird. 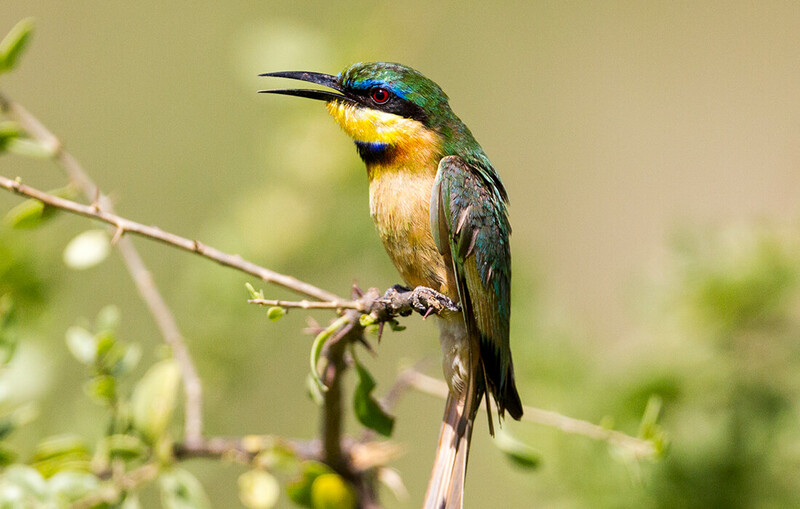 The white-throated bee-eater, also found in Africa, has pale green upper parts, a black-and-white striped head, white throat (hence the name), black upper breast band, red eye, and a black bill. You can tell them apart at a glance: the white-fronted has red throat, while the white-throated has a white throat! Branching out. White-fronted bee-eaters inhabit wooded savannas, sandy cliffs, African grassland and open scrub, especially in the Great Rift Valley of Kenya at 4,593 to 6,562 feet (1,400 to 2,000 meters). They avoid heavy forests. Colony sites are on nearly vertical, bare cliff faces. Birds normally change sites during the months before breeding season. The colony site is 2.5 to 4.4 miles (4 to 7 kilometers) from the foraging area. White-throated bee-eaters breed in a narrow band of sub-desert steppe along the southern edge of the Sahara, and then migrate south to humid tropical rain forests of west and central Africa for the non-breeding season. The rather open habitats provide more insect foraging opportunities. Bee-eater nests are dug into the earth. A “hole" home. All bee-eaters are earth-hole nesters, digging their tunnels with an oval chamber at the end for eggs. They lay a single clutch annually. Keepers at the Zoo and Park encourage this nesting behavior by providing the birds with tubes of sandy soil attached horizontally in a vertical wall, so the birds can excavate their tunnel nests. White-fronted bee-eaters nest in colonies averaging 100 individuals, digging roosting and nesting holes in cliffs or banks of earth. A population of bee-eaters may range across many square miles of savanna, but will come to the same colony to roost, to socialize, and to breed. Feast on the fly. Bee-eaters are insectivorous. Their diet is made up primarily of bees, but they also take other flying insects, depending on the season and availability of prey. Two hunting methods have been observed. They either make quick hawking flights from lower branches of shrubs and trees, or glide slowly down from their perch and hover briefly to catch insects. Bee-eaters at the Safari Park get a well-rounded diet of live crickets, mealworms, and fresh bees from a nearby hive. Bee-eaters at the Zoo have a similar culinary experience. Pieces of information. Bee-eaters regularly regurgitate pellets, which provide a boon of information for researchers. They found that the birds exploit nearly all the day-flying insects that occur in their respective habitats, but bees remain a favorite. Staying buzzzz-y. Bee-eaters are diurnal, emerging from nest holes after dawn. They perch nearby, preen, then the flock heads out to the feeding area. Each clan visits its own territory about a mile (2 kilometers) away during the nesting season (they feed farther away when not nesting). The birds enjoy sunbathing and dust bathing, which reduces ectoparasites. During the breeding season, they will use the late afternoon to eat sand, snail shell, and other calcium-rich items. There is a great deal of visiting and socializing at different burrows in the evening during the nesting season. During non-breeding times, the bee-eaters arrive at their roosting sites before dusk. White-fronted bee-eaters nest in colonies averaging 100 individuals, digging, roosting, and nesting holes in cliffs or banks of earth. Help at home. White-fronted bee-eaters M. bullockoides are colonial cooperative breeders. About half of breeding pairs get assistance from non-breeding adult birds. These “helpers” assist in all aspects of nesting, which significantly improves fledging success. In the bee-eaters’ extended family clan, in which multiple pairs may breed simultaneously (plural breeding), the “helpers” are indispensible. Studies have shown that about 60 percent of breeding pairs have 1 to 5 helpers! But with so many possibilities for helpers to chip in, they often have to choose how to allocate their aid among several potential recipients to whom they are unequally related. 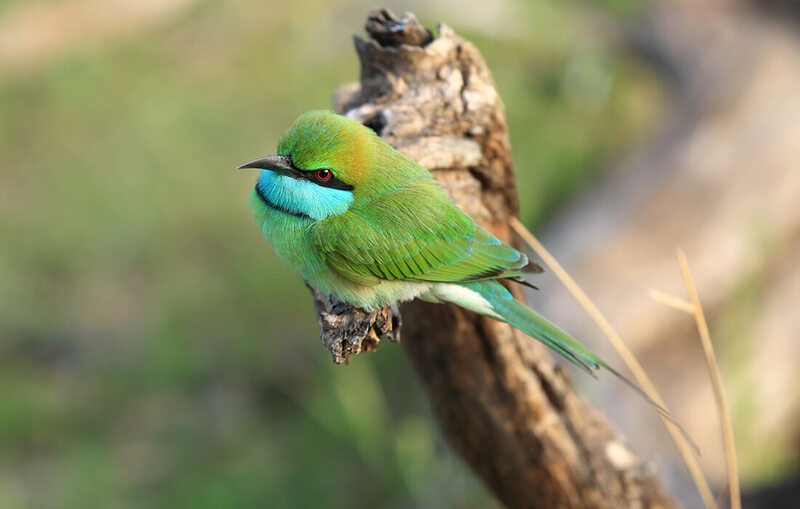 A recent study, which used five years of data from a color-marked and genealogically known population of white-fronted bee-eaters in Kenya, examined the role of kinship in the birds’ helping decisions. They found that, not surprisingly, bee-eater helpers preferentially chose to aid their closest genetic relatives. Sometimes, prospective parents have to use strong-arm tactics to wrangle willing helpers. Stephen Emlen of Cornell University spent nearly a decade studying white-fronted bee-eaters. He and his colleague observed parents butting into their son’s “love life” and begging for his courtship treat, and interfering with his mating strategy. If that didn’t work, they would even block the entrance to their son’s burrow, to prevent his mate from entering to lay her eggs. Some birds relented and abandoned their own breeding efforts to help their parents raise another clutch. In contrast, the white-throated bee-eater is solitary, but cooperative. 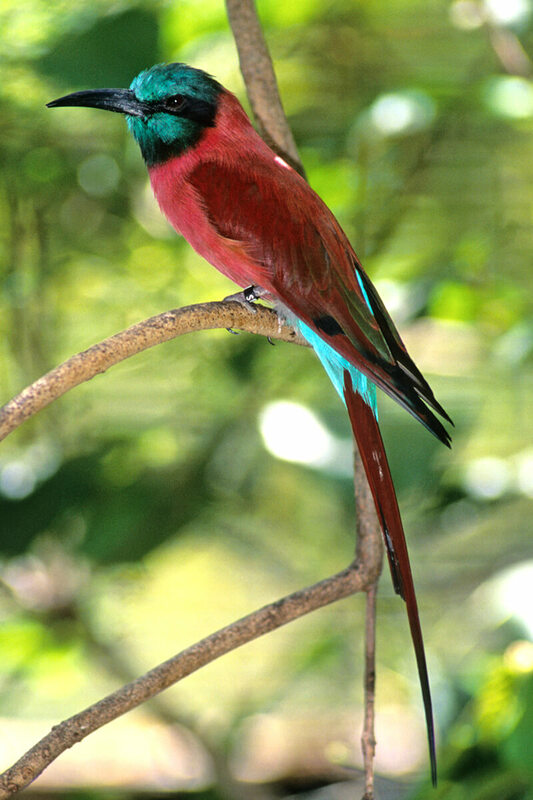 Some species, like the southern carmine bee-eater, is colonial but not cooperative. White-fronted bee-eater chicks are raised by their parents as well as "helpers" in the group. 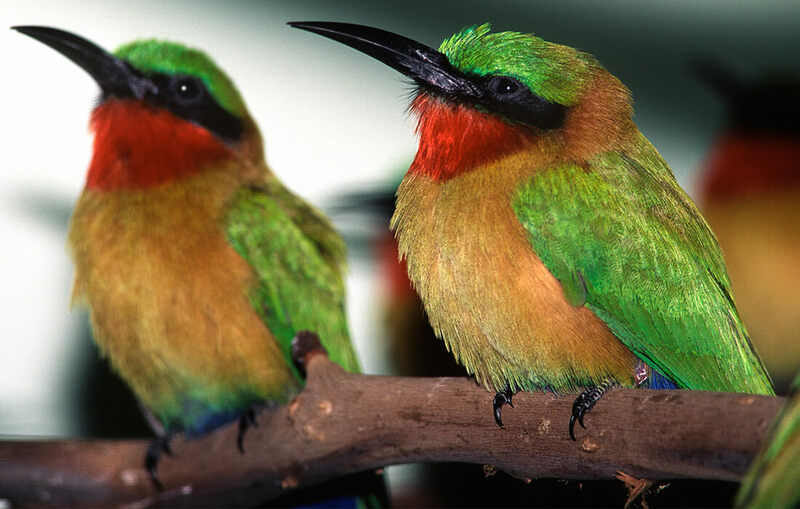 Two bee-eater species thrive in a walk-through aviary in the Zoo's Africa Rocks: white-fronted Merops bullockoides and white-throated M. albicollis bee-eaters. There is also a flock of white-fronted bee-eaters at the Safari Park, on the pathway to the gorillas. That flock has produced over 100 chicks over the years, more than all the other 233 AZA facilities combined. European bee-eaters help keep insect populations in check. Dodging disaster. Safety in numbers is usually a good plan. And being diurnal can be helpful. For these deft and dashing avian wonders, hawks can still be a threat. But it’s human activities impacting their ecosystems that are more detrimental. In Cyprus, up to 6,000 European bee-eaters are shot annually. Beekeepers also sometime persecute the birds for eating their bees. Nevertheless, these birds are doing well. With its cooperative breeding behavior and wide geographic range, bee-eaters appear to be holding their own throughout their territory. The International Union for Conservation of Nature (IUCN) Red List of Threatened Species currently categorizes bee-eater species as Stable or of Least Concern. You can help the San Diego Zoo Global Wildlife Conservancy bring species back from the brink by supporting our conservation projects at endextinction.org. Together we can save and protect wildlife around the globe. Nest “helpers” take on all responsibilities for survival: excavate and defend nest, bring food to the breeding female, incubate eggs, feed nestlings, and care for fledglings. Courtship is lengthy, often 6 to 8 weeks! 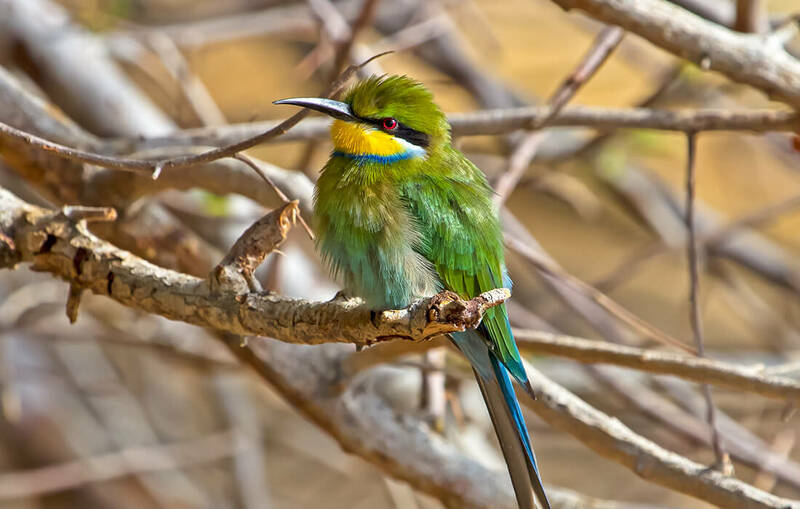 As colonial living, burrowing animals, bee-eaters enhance biodiversity by aerating and reworking the soil, thus allowing other organisms to thrive. Excited calling with quivering tail feathers is a greeting to clan members. The beautiful carmine bee-eater of Africa has been known to hitch a ride atop zebras, ostriches, grazing sheep, or kori bustards in search of insects. That’s called autolycism. When excavating a burrow, bee-eaters use both legs to push soil backwards in a bicycling-type motion. White-throated bee-eaters will not only follow large African herbivores, but also people and their vehicles, which kick up the insects and the birds swoop in to catch them.